Rakusan did not include the Fan Series in his main sequence numbering. Therefore, the original number used for each of the 36 Series prints has been modified to identify the Fan Series members of its theme. The five different fan silhouette shapes have been here assigned arbitrary numbers 1 through 5. To indicate a fan design these shape designations are added to the 36 Series number separated by a hyphen. 107-4 is the Fan Series design with fan shape 4 in the 107 Morning Glory theme. Like all other designs in this series, 107-4 was only produced in a single print run, and few copies are currently documented. The individual designs in the 107 Morning Glory theme were completed in at least two stages. Four of the five fan designs (including 107-4) have seal C which indicates a carving date during the first half of 1934. However, the remaining fan design and the 36 Series design 107 have seal B which indicates a later carving period closer to the time of publication. The composition of 107-4 shows a section of morning glory vine with one fully open flower and a few buds. 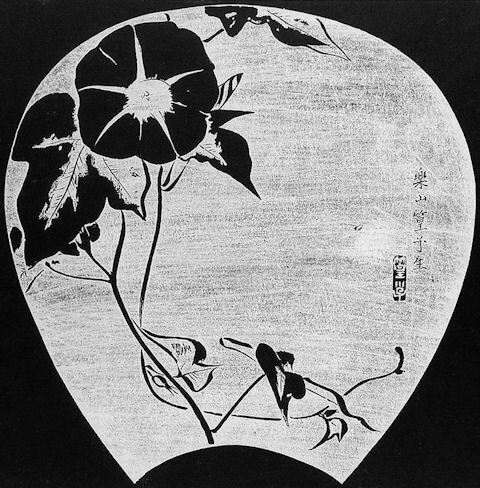 The morning glory stems and leaves are rendered in a bold wide line and so heavily shaded as to appear almost in silhouette. In contrast the spent flower and the bamboo poles are finely engraved lines. 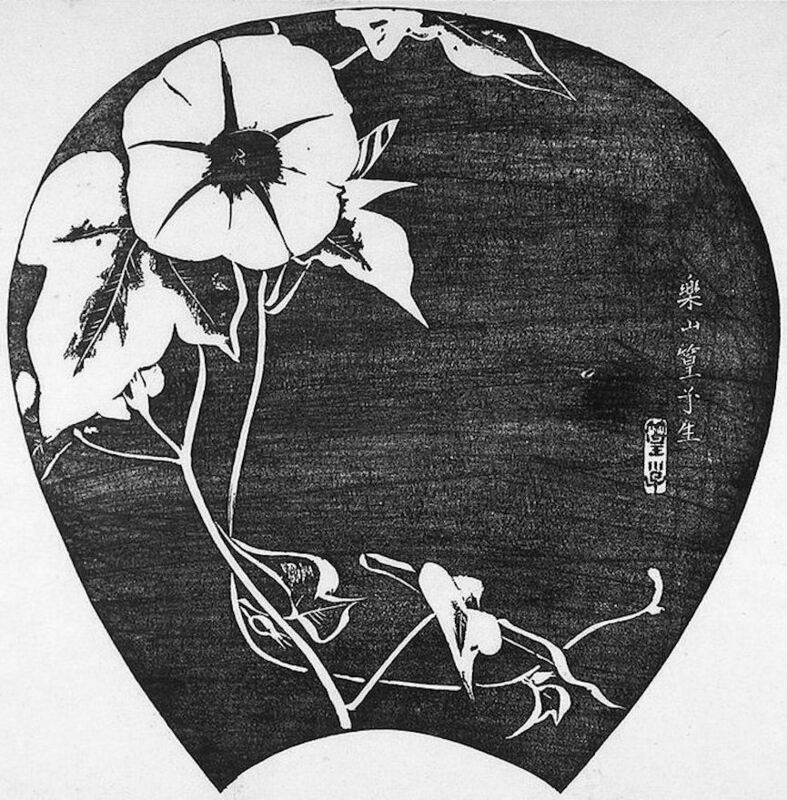 The design is carved so that the ishizuri version is an exact of the original sketch. Japanese Morning Glory, Ipomoea (Parbitis) nil, 朝顔, あさがお, アサガオ, asagao, is originally not native to Japan. However, it was imported from China about 1,200 years ago, and it is now important in Japanese culture. Today, the species is pan-tropical, easily naturalizes, and its ultimate origins are difficult to sort out. In Japan morning glories have been extensively hybridized and selected to modify their colors and flower-forms. Rakusan used several different varieties in his designs.